Fill in your details below so that we are able to verify that you are eligible for the incentive. From now till the 31st December 2017, Real Estate Agents get $50 credit when you sign up and complete your first ride as a GrabHitch driver with referral code PROPERTYHITCH! Not a Real Estate Agent but interested to sign up for GrabHitch? Find out more about how to sign up here! And the best part… you get to keep the entire fare for the trip! driver perks. Receive exclusive merchandise, save on motor insurance, petrol, and many more! In the event of an unfortunate accident during a Hitch ride, your personal private motor insurance should usually cover the costs incurred from the accident. If you are an existing GrabHitch Driver, spread the love! Get $20 for every friend you refer to sign up as drivers! Find out more about our GrabHitch Driver Referral: here! This promotion is only eligible for Real Estate Agents who have not signed up with GrabHitch as a driver previously. 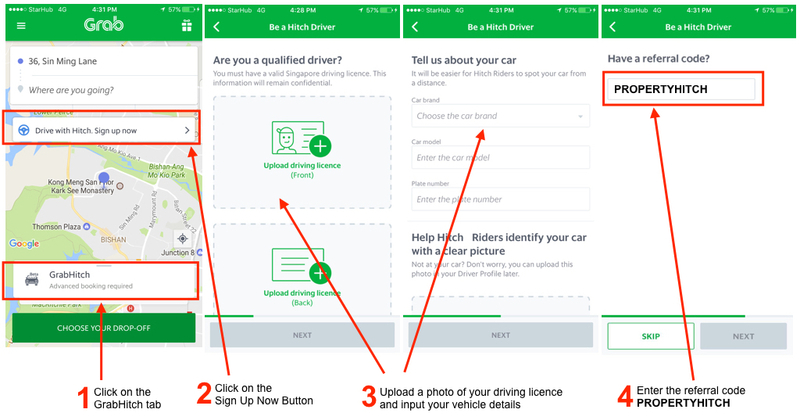 The CEA Registration Number provided needs to tally with the driving license details provided during the driver application process to qualify for the signup incentive. This incentive is only eligible for new drivers who sign up and successfully complete 1 Hitch ride as a driver between 23rd August 2017 @ 00:00 hours –31st December 2017 @ 23:59 hours. New drivers must sign up with the referral code PROPERTYHITCH in order to qualify for the $50 credit incentive. The processing of the $50 credit into your GrabHitch driver wallet will only be conducted after the incentive period has ended (post-31st December 2017). Please allow up to 10 working days for the processing of the $50 into your GrabHitch driver wallet.